The MINItrol MRT is used to control a solenoid valve that takes samples of waste water every 1000 gallons. The unit also keeps a running Total and also has a Rate display available. Preset B and Relay B are used to control the samples. Preset B is set to 1000 and the duration of Realy B output is set for 10 seconds. Relay B controls the solenoid valve which will take a 10 second sample every 1000 gallons. When the relay is set for a duration other than 0.0, it automatically resets counter be upon reaching the preset (1000). 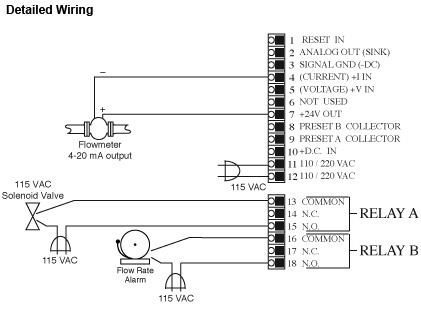 The signal from the flowmwter is also connected to Input A which provides the totalizer and rate information. 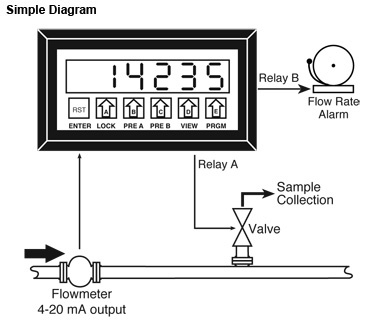 Relay A can be used as a total or flow rate alarm if desired. MRT-S: Special version of the MRT with separate scaling for rate and total. The INT69 is used to control a solenoid valve that takes samples of waste water every 1000 gallons. The unit also has a Rate display available with a flow rate alarm. Preset A and Relay A are used to control the samples. 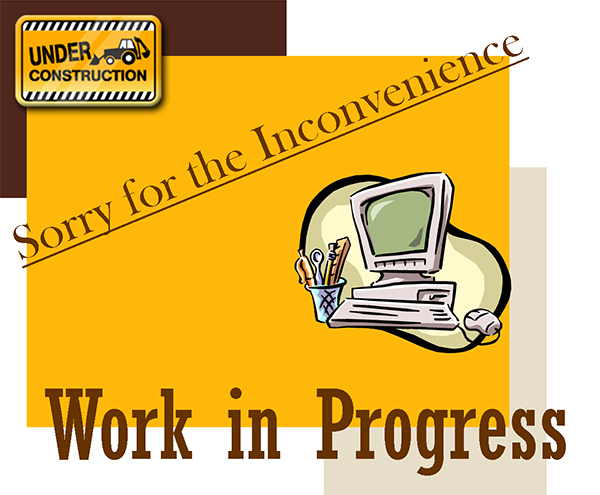 Preset A is set to 1000 and the duration of Realy A output is set for 10 seconds. Relay A controls the solenoid valve which will take a 10 second sample every 1000 gallons. When the relay is set for a duration other than 0.0, it automatically resets the total upon reaching the preset (1000). 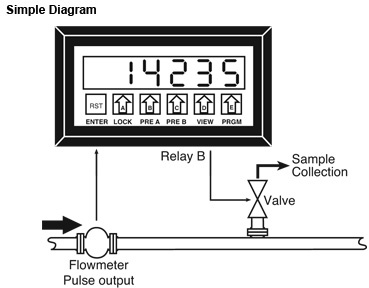 The unit can display either the flow rate or the total. 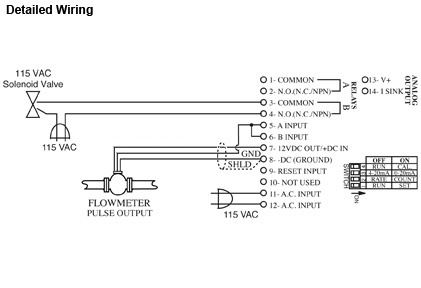 Preset B and Relay B are used for flow rate alarm. Preset B is set for 10 (GPM). If at anytime the flow rate exceeds 10 GPM, the alarm will sound. ES-756: Special version of the INT69 with Separate Scaling of Rate & Total.